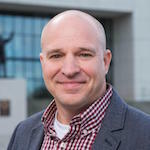 Michael Bruce, a transplanted Sooner, is beginning his seventh year of teaching sports broadcasting in the Journalism & Creative Media Department at the University of Alabama. Prior to coming to UA, he taught courses in communication, advertising, broadcasting, and sports media at the University of Oklahoma and his alma mater, Oklahoma Baptist University. His professional experience includes various video/television production positions at television stations and in corporate communications. For more than a decade, he has worked as a freelance TV director, technical director, and camera operator for live television coverage of high school, college, and professional sporting events. Clients have included the New Orleans/Oklahoma City Hornets, Sooner Sports Network, Cowboy Sports Network, and Crimson Tide Productions. In addition to SVG, Dr. Bruce is actively involved in numerous professional organizations. He is currently serving as the president of the board of directors for BEA (Broadcast Education Association). In 2008 - 2009, he served as the founding chair of BEA’s Sports Division. Professor Bruce earned a PhD in communication from the University of Oklahoma in 2012. He received an MA in journalism and mass communication from OU in 1993. In 1989, he received a BA in telecommunication from OBU, where he met his wife Teressa. They have two children, Kelsey and Eli, and a Weimaraner named Heidi.